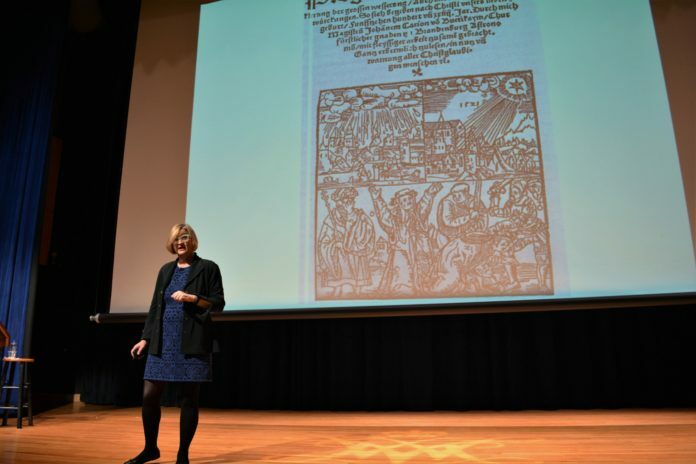 Professor of English and American studies Elizabeth Losh delivered the 13th Tack Faculty Lecture, entitled, “Fake News for Real People.” Her lecture addressed what Losh called one of the most pressing and relevant issues of today’s world: how much can the news be trusted? Each semester, the Tack Faculty Lecture Series, funded by Charles and Martha Tack ’78, gives a faculty member the opportunity to present on a topic of general interest. Losh studies the digital humanities and new media ecologies at the College of William and Mary. “Is there a day, a single day or an hour, that passes without us hearing the term ‘fake news,’ whether from a POTUS tweet, a newscast or among our friends?” Provost Michael Halleran asked as he introduced Losh. Losh explained that today many people share fake news stories on social networking sites without realizing they are sharing fake news. She pointed to satirical videos on the sport of “ball-less soccer” and even a comedic news report on the discontinuing of Reese’s peanut butter cups as examples of this phenomenon. Losh studies rhetoric and she said she believes that understanding Aristotle’s three main methods of persuasion — ethos, pathos and logos — is helpful for understanding the problem of fake news. Many contemporary news stories, Losh said, overuse pathos, which appeals to the emotions of the reader, and lack ethos and logos, which appeal to the authority or credibility of the author and to the logic of an argument, respectively. To untangle what she called the “complex media ecology” of fake news, Losh presented a few simple premises. First, she noted that fake news is not purely a partisan issue. Second, she pointed out that fake news often has a purpose other than deception, such as satire. Finally, she concluded, the problem at hand is not limited to fake news articles. “The problem is that we are living in a time when it is very difficult to ascertain truth,” Losh said. Losh also categorized “fake news” within various genres. Fake news, she said, can fall under the category of satire or parody, such as Onion stories or “The Daily Show,” or it can fall under the category of conspiracy, such as “Loose Change,” a darkly satirical documentary about the Sept. 11, 2001 attacks. Today, Losh said, the term “fake news” is largely used to describe distrust of mainstream news sources. Losh identified three trends in the way that we distribute and collect news. First, she said, authority is replaced by authorization. Instead of elected officials or experts who act as “gatekeepers” for legitimate transactions, readers rely on authorization processes and passwords. Next, she said that authenticity is replaced by authentication: readers rely on procedures and algorithms, such as touch verification used to unlock a cell phone, instead of personally investigating the sincerity of an item. Losh also said veracity is replaced by verification — when readers rely on third-party websites, such as Google, they allow truth to be manufactured through these procedures. Losh noted that because of the inherently partisan nature of government, it cannot be relied on to regulate news. She also said that fact-checking websites cannot fix the problem of fake news, since they often lack adequate funding. Instead, she pointed to media literacy as the most promising solution. If young people were educated in media literacy, she argued, they would be better equipped to understand and recognize fake news. Sarah Bomfim ’20 attended this lecture because she was interested in learning more about fake news and how to spot it. Losh ended her presentation by advocating for an interdisciplinary approach when addressing fake news and she placed a particular emphasis on the humanities. History, philosophy, rhetoric and even foreign languages, Losh said, are critical for identifying fake news. “This is my rallying cry to support the humanities,” Losh said. Previous articleStudents march in Williamsburg, D.C.